This map shows the Primary Highway Freight System (PHFS) plus remaining Interstates not on the PHFS, approximately 51,029 of roads. These routes are identified as the most critical highway portions of the U.S. freight system and that is informed by measurable and objective national data. 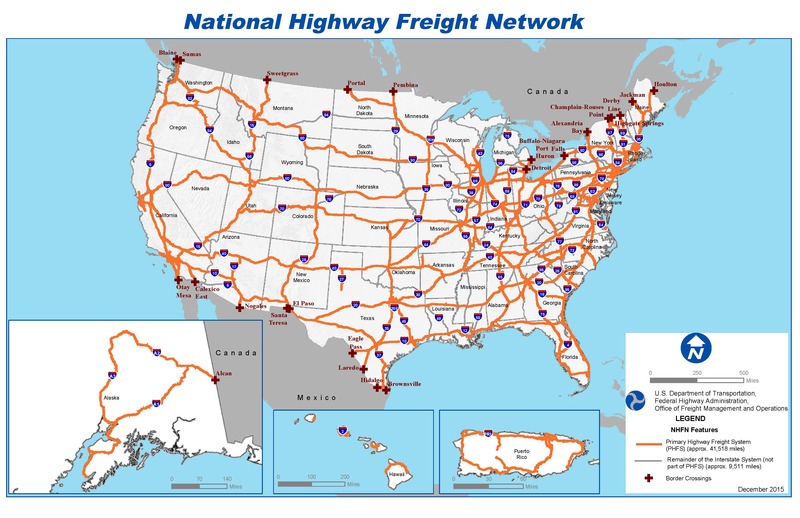 The map also illustrates key land ports of entry in the U.S. based on an inventory of national freight volumes conducted by the Federal Highway Administration during the designation process for the MAP-21 highway-only primary freight network (PFN) under 23 U.S.C. 167(d).